Why is he such a big name in the skeptic community? I don't see him as particularly formidable. But then again, my personal bias does not generally find any materialist formidable. The sceptical community are concerned with who gets rekt, beasted and destroyed (Must Watch!!!!!!). That is Shermer's constituency. He writes a lot of books, has controversial opinions, does talk shows and debates and is comfortable representing New Atheism++Ultra on TV. He also founded 'The Skeptics Society'. Now obviously he's never been convicted of anything in court, so for me this brings up the question of at what point does a person become persona non grata? At what point should he no longer be given a platform without providing a serious account of his actions? I laugh as I read these responses. I am beginning to think that the only question we can suggest is to Alex is "Hey Shermer, you x#@* WTF?" I think maybe the first question, is whether this guy is really worth interviewing! and try to pick apart whatever facile way he has found to explain away this event! I wonder if he ever got a proper analysis of why the radio no-longer worked - to try to determine if it was even remotely plausible that it would not work with new batteries, and then work for one day, and never again! yeah, window is closed interviewed him last Friday. To vintage electronics geeks, old transistor radios with "intermittent" circuits are no mystery at all. Varying humidity, temperature and mechanical movement on old copper contacts found in switches and battery compartments, as well as the effect of aging capacitors and resistors on circuits, are well-known causes of maddeningly intermittent functionality. Tiny temperature-induced contractions or expansions of small metal or plastic parts over time can cause otherwise dead circuits to come to life suddenly. Yet, to the uninitiated, this well-understood but arcane electronic quirk resembles magic. But what about the spooky way the radio happened to be tuned to a station playing a "love song"? Since the subject of love and relationships literally dominates popular music, it isn't at all unusual for a radio station to be playing a song about love. It is possible to speculate that the radio could have been altered, for example modern components could have been put into the casing of the 1970's radio so a remote signal could start it. However, the coordination of a small-scale conspiracy involving costly parts and services by an electronics technician seems unlikely (except to those who feel Shermer would spare no effort to accomplish evil to prevent his new wife feeling bad about him). Jerry Coyne regrets that Shermer made no attempt to get more evidence, for example by looking into the radio. Coyne further reprints a post which includes, "It would be mildly interesting to have an electronics expert determine exactly what is wrong with the radio." Since Shermer and his wife did not provide the radio for investigation we will quite likely never know if there was more to it than a 1970's vintage radio. Readers are left to apply Occam's razor (remember, make the minimum necessary assumptions!) Which is more likely? That the story we have been told is not complete, i.e. Shermer deliberately held something back, or it is not fully accurate i.e. Shermer lied about some detail. Possibly he felt guilty about accusations of sexual misconduct or feared their effect on his new wife. So he secretly engineered a technologically complex illusion that would emotionally bond his new wife to him. That the radio was not entirely the way it seemed, i.e. it was covertly modified to be more technologically advanced by multiple conspirators at CFI who took part in a coordinated illusion in order to ensure Shermer would stick with his new wife and avoid sexual misconduct that might cause them further embarrassment. That the 1st Law of Thermodynamics is wrong and spooky things really happen like the dead communicating with the living through some unknown but very powerful force. That it all was just a remarkable coincidence. On the other hand Dean Radin has caught up, or maybe its me catching up? Ah, Utopia! I've no idea who this man is, but from the title and the comments here, this is gonna be gooood! Since it's too late to offer a question, there is a film I think of every time someone says 'utopia'. The Ballad of Jack and Rose with Daniel Day Louis. It was kind of under-rated, imo, at least in the States. I find it such a poignant reminder of the fact that 'one man's trash is another man's treasure'. While I have a lot of time for Dean I seriously doubt he has had time enough to imbibe enough 'ancient wisdom' to write other than an entirely superficial book on the subject. Still, that might be very useful. But a 'guide to the secret power of the universe' sounds like more like the hyperbole of a publisher who has no idea about the subject. I will have to buy the damned book and read it. Alex, if you are going to have Dean, and I assume you will, of course, give us a timeframe so we have time to know whether we can read the book in time. 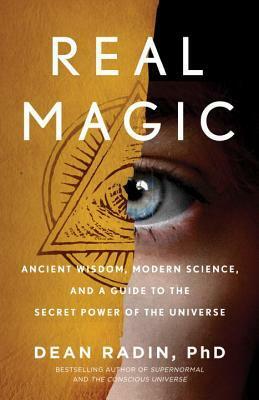 Dean is in a unique position to match his psi research against his interpretation of ancient wisdom, and the simple fact that Dean has gone down this path suggests that he has strong reasons for asserting there is a powerful match. The book would be pointless otherwise. Okay bought it, but it isn't released until April 10 here.